"I am at a point in my professional career where I cannot afford to not be a member of FSAE. Being an FSAE member allows me to connect with other association professionals who are experiencing the same challenges as I am. It also provides me with endless educational opportunities to learn and grow. I would encourage any association professional to join FSAE, take advantage of all the education offered and get involved in committees – the return on investment is tenfold what you put into it." For over 50 years, association professionals have enhanced their careers and ensured professional growth and success because of their allegiance with FSAE. Association Management has its own challenges and complexities. It’s helpful to be able to learn from others that have the same difficulties and experiences as you. 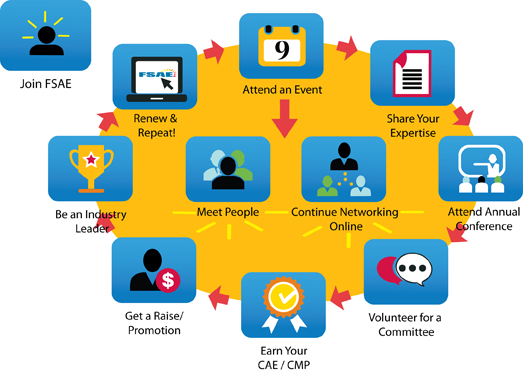 FSAE fosters that collaboration through networking and educational events, online communities and resources. Our members include anyone who works for an association such as CEOs, management, meeting planners, membership staff, marketing staff, the receptionist and anyone in between. 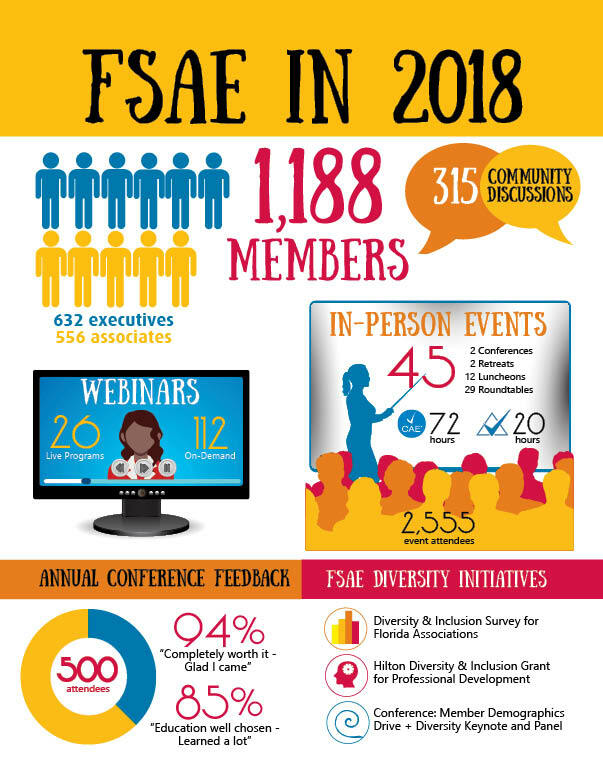 FSAE is committed to diversity and inclusion at every level of the organization. Diversity and Inclusion includes, but is not limited to, age, gender, race, religion, ethnicity, disability, appearance, sexual orientation, gender identity, personality type and geographic location. FSAE understands that diversity and inclusion allows us to make better decisions because we are exposed to different opinions, perceptions, values and experiences. These differences are integrated throughout FSAE to create an experience that expands everyone’s horizons and opportunities for engagement, learning and leadership. Industry suppliers are also members of FSAE, including hoteliers, CVB staff, destination representatives, technology providers and service providers. Click here to learn more about our membership categories. "I moved from Chicago to a little town outside of Tampa about two years ago, and joined FSAE almost immediately. I’ve been in the association space for nearly 10 years and was a member of Association Forum in Chicago. I felt part of that community and hoped I would find it again down here - which I have through FSAE. As someone who works remotely/from home, I take advantage of FSAE’s well-organized local networking opportunities like the round-table discussions and power lunches. The topics are great, and for me, there’s something about talking with, and being surrounding by, others who “get-it”- it makes me enjoy our profession even more." "FSAE has not only added a value to my professional career but it has helped shaped me as a person. 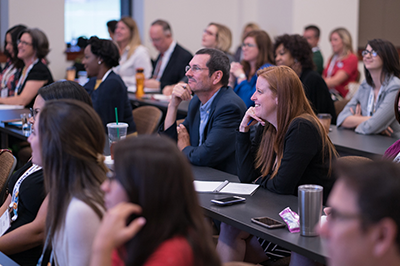 Through education, networking, and professional development, my experience with association management as a young professional has expanded widely and rapidly. FSAE has challenged me to learn more about different aspects of association management, and I’ve experienced huge growth that can only be attributed back to my mentors, my colleagues, my friends, and professional organizations like FSAE." 1. Access to a Peer to Peer Network. Network and learn from 1,100 professionals that do what you do and understand the challenges and issues that you face. Build relationships through our many in-person events or tap into your peers’ experience and expertise instantly through the Online Community. 2. Continuing Professional Education. 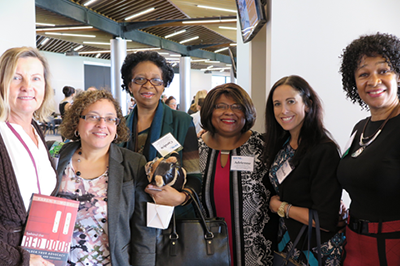 Stay current with best practices; we host over 40 in-person events statewide each year. We also offer monthly Webinars and affordable on-demand programs appropriate for chief staff executives, their employees, and suppliers. 3. Career Enhancement. Publish an article in our magazine. Earn your certification. Chair a committee and strengthen your leadership skills while playing an important role in FSAE’s success. Be recognized as a leader among your peers. 4. Job Opportunities at Your Fingertips. Employers turn to FSAE’s online Career Center when they need qualified professionals. Post resumes, search available positions or subscribe to receive opportunities via email. 5. Information is Power x10. * SOURCE - FSAE’s magazine is published 6 times a year. FSAE-news: monthly electronic newsletter with time sensitive information. * Good to Know: FSAE’s weekly news digest. * Association RESOURCE: our membership directory/ buyers guide. * Visit www.fsae.org for alerts, events, registrations, certifications, and publication information. Bonus: Invest in Your Future. The FSAE Foundation offers professional development grants for CAE/CMP certification and to attend the FSAE or ASAE Annual Conference. 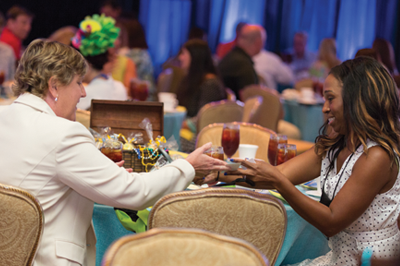 In the past 15 years, the Foundation has awarded members over $155,700 to reach their professional goals.